May 10, 2010 — Hannes Arch of Austria was declared the winner of the Red Bull Air Race in Rio de Janeiro on Sunday when adverse weather conditions made it impossible to continue the racing during the Top 12 round and the results were then based on Saturday’s Qualifying sessions. The Austrian had won the Qualifying point. Britain’s Nigel Lamb was awarded second place based on coming second in Qualifying while championship leader Paul Bonhomme was forced to settle with a disappointing third place in the third race of the 2010 season. Heavy rain and winds swept across Rio, drenching the 250,000 spectators, during the Top 12 round that initially forced a delay of the high-speed, low-altitude flying in front of the city’s Flamengo Beach with pilots in the air called back to the Race Airport. The pilots were all hoping conditions would improve but organisers eventually decided not to continue with the Top 12 due to the inclement weather and unpromising forecast. It was only the second time that this has happened in the 46-race history of the Red Bull Air Race World Championship. The last time was in Longleat, UK in 2006 where Bonhomme was declared the winner. Arch’s second-consecutive victory also cuts Bonhomme’s championship lead to three points. Bonhomme is on 31 points after collecting nine points for his second-consecutive third place finish while Lamb is second on 28 points for his two second-place finishes in three races this year and Arch on 27 points after collecting a maximum 13 points in Rio – 12 for the victory and one bonus point for winning the Qualifying on Saturday in front of 400,000 Brazilian fans. Arch also won the last race in Perth. Bonhomme and the other pilots had all known that rain was in the forecast for Sunday even though it had been bright and sunny all week. They all put their best efforts into winning Qualifying on Saturday because they knew there was a risk that the race could not be completed. 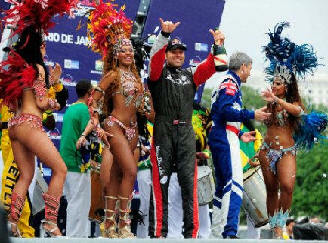 Bonhomme, who got his very first racing victory in Rio in 2007, was disappointed with his Qualifying run. Accustomed to flying in bad weather in Britain, he was hoping to get the chance to make amends for his Qualifying defeat on Sunday as light drizzle made the flying challenging during the Wild Card session and the first half of the Top 12. The next Red Bull Air Race takes place in Windsor, Canada on June 5/6. According to the Official Rules & Regulations of the Red Bull Air Race World Championship (Part A, Clause 7): In the case of bad weather, the Race Committee may decide to cancel flying sessions on Race Day. In the case where there are no valid flying sessions the rankings will be based on the results of Qualifying.